There's a great new book by Farrell and Lewandowsky, Computational Modeling of Cognition and Behavior (at the publisher, at Amazon.com), that includes some chapters on Bayesian methods. Each chapter includes a little "in vivo" commentary by an outside contributor. My commentary accompanies their chapter regarding JAGS. The commentary is posted here in a succession of three blog posts; this is 3 of 3. (Part 1 is here, and part 2 is here.) Do check out their book! While a JAGS model specification captures the full structure of the model, it can help human beings to have a diagrammatic representation of the model. A diagram can help the viewer achieve a comprehensive overview of the relations between parameters and their meanings with respect to each other and to the data. A good conceptual diagram of a model can also guide writing the JAGS model specification. For example, Figure 8.13 (below) shows a representation of the normal model used in the previous section. Because of graphical conventions for probability distributions, the data must be shown at the bottom of the diagram. Starting with yi, the diagram shows that the data come from a normal distribution that has parameters μ and σ. Then the top of the diagram illustrates the prior distributions on the parameters. Figure 8.13. Diagram of the normal model, in the style of the book, Doing Bayesian Data Analysis (Kruschke, 2015). Scan the diagram from the bottom up, that is, beginning with the data yi at the bottom. Notice that every arrow has a corresponding line of code in the JAGS model specification. Often when I’m creating a new model, I first sketch out a diagram in the style of Figure 8.13, and after I’m sure I have a coherent structure, then I type the model into JAGS, scanning the diagram from the bottom up. 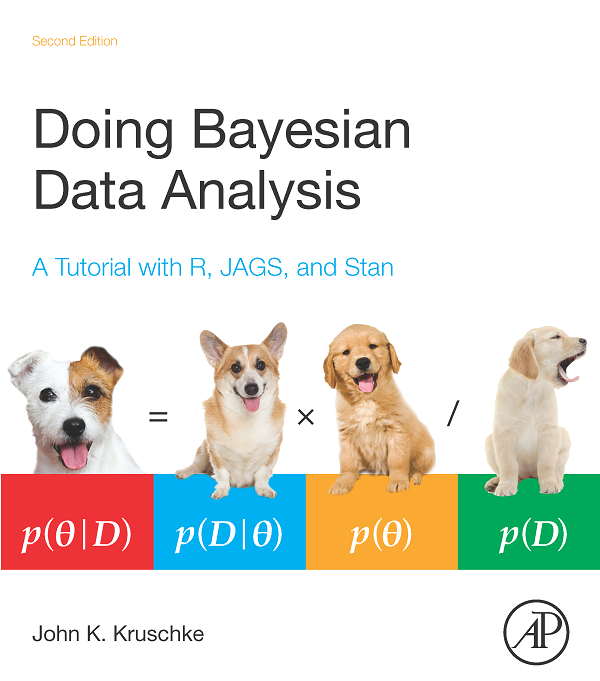 There is another convention that is sometimes used to illustrate Bayesian models. This convention has historical roots in general treatments of statistical models that specify probabilistic dependencies between parameters such that no dependencies cycle back on themselves. Such structures are called directed acyclic graphs (DAG’s). In particular, the DAG diagrammatic convention was used by the software DoodleBUGS, which was a component of WinBUGS (Spiegelhalter, Thomas, Best, & Lunn, 2003), the precursor to JAGS. Figure 8.14. Diagram of the normal model, in the style of conventional graphical models. Shaded node indicates observed (not estimated) values. Plate indicates repetition. Notice that the arrows have no relation to lines of code in the JAGS model specification. Figure 8.14 shows a DAG diagram for the normal model. The arrows between variables indicate that the data, yi, are dependent on parameter μ and on parameter σ. But the diagram does not indicate whether or not the two parameters participate in the same distribution or come from different distributions. The diagram does not show the prior distributions at all. Importantly, the diagram provides no clue how to express the model in JAGS because there is no relation between the arrows in the diagram and the lines of code in JAGS. Often when DAGs are used for illustration, the diagram will be accompanied by a list of all the equations that specify the model. While the equations provide complete information, the reader must scan back and forth between equations and diagram to make sense of the diagram. For more disucssion, see p. 197 of Kruschke (2015). It’s repeatedly emphasized for many different models in that book that every arrow in a model diagram (usually) has a corresponding line of code in JAGS. See another comparison of diagrams at this blog post. See tools for creating diagrams at this blog post. There's a great new book by Farrell and Lewandowsky, Computational Modeling of Cognition and Behavior (at the publisher, at Amazon.com), that includes some chapters on Bayesian methods. Each chapter includes a little "in vivo" commentary by an outside contributor. My commentary accompanies their chapter regarding JAGS. The commentary is posted here in a succession of three blog posts; this is 2 of 3. (Part 1 is here.) Do check out their book! All mathematical models are designed to describe structure in data. Logically, to comprehend a model, we must first know what the data are that the model is supposed to describe. We begin with describing how the data are probabilistically distributed according to some likelihood function. The likelihood function has parameters, which typically describe some trend or relation in the data. The parameters might be expressed in terms of higher-level parameters. Finally, the parameters have uncertainty, expressed as prior distributions on the parameters. The JAGS model-specification language lets us write models in this logical and comprehensible way: Start with the data, write the likelihood function, then write any dependencies among parameters, and finish with the prior distribution on the parameters. This makes it easy to write the model, and, importantly, easy for readers of the model specification to make sense of the model. The model specification (above) is easy to comprehend sequentially in reading order. But for human readers trying to comprehend the statements, order does matter. 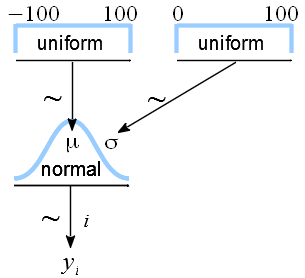 Especially for complicated models with unfamiliar or arbitrary parameter names, it can be very difficult to understand model specifications that begin by specifying priors on parameters before specifying what distributions those parameters play a role in, and what the relation of the data to the parameters is. Therefore, be kind to your readers, and to your future self who will look back on your code months later. Specify JAGS models starting with the data likelihood then working through the parameters and their priors. These ideas are expressed with more examples on p. 199 and p. 414 of Kruschke (2015). There's a great new book by Farrell and Lewandowsky, Computational Modeling of Cognition and Behavior (at the publisher, at Amazon.com), that includes some chapters on Bayesian methods. Each chapter includes a little "in vivo" commentary by an outside contributor. My commentary accompanies their chapter regarding JAGS. The commentary is posted here in a succession of three blog posts; this is 1 of 3. Do check out their book! Bayesian analysis of complex models is possible only by virtue of modern software that takes an abstract model specification and returns a representation of the posterior distribution. In software that uses Markov-chain Monte Carlo (MCMC) methods, such as JAGS, the representation is inherently noisy. The random noise from MCMC tends to cancel out as the chain gets longer and longer. But different aspects of the posterior distribution are differently affected by noise. A relatively stable aspect is the median value of the chain. The median tends to stabilize relatively quickly, that is, with relatively shorter chains, because the median is usually in a high-density region of the posterior and the value of the median does not depend on the distance to outliers (unlike the mean). But other crucial aspects of the posterior distribution tend to need longer chains to achieve stable values. In particular, a crucial aspect of a parameter distribution is its width. Narrower distributions connote more certainty in the estimate of the parameter. A very useful indicator of the width of a distribution is its 95% highest density interval (HDI). Parameter values within the 95% HDI have higher probability density than parameter values outside the HDI, and the parameter values inside the 95% HDI have a total probability of 95%. An example of an HDI is illustrated in Figure 1. Figure 1. Example of a 95% highest density interval (HDI). On the axes of the graph, θ denotes a parameter in the model, and p(θ|D) denotes the posterior distribution of that parameter. The limits of the HDI are marked by the ends of the double-headed arrow. Any value of θ within the HDI has higher probability density than any value outside the HDI. The mass within the 95% HDI, shaded by gray in the figure, is 95%. Because the limits of an HDI are usually in the low-density tails of the distribution, there are relatively few steps in the MCMC chain near the limits. Therefore it takes a long chain to generate sufficiently many representative values of the parameter to stabilize the estimate of the HDI limits. How long of a chain is needed to produce stable estimates of the 95% HDI? One useful heuristic answer is 10,000 independent steps. The rationale for the heuristic is explained in Section 7.5.2 of Kruschke (2015). Note that the requirement is 10,000 independent steps. Unfortunately, most MCMC chains are strongly autocorrelated, meaning that successive steps are near each other, and are not independent. Therefore we need a measure of chain length that takes into account the autocorrelation of the chain. Such a measure is called the effective sample size (ESS), for which a formal definition is provided in Section 7.5.2 of Kruschke (2015). ESS is computed in R by the effectiveSize function (which is in the coda package, which in turn is part of the rjags package for JAGS). For example, suppose we have generated an MCMC chain using the rjags function, coda.samples, and the resulting object is called mcmcfin. Then we can find the ESS of the parameters by typing effectiveSize(mcmcfin). It is crucial to realize that (i) the ESS will usually be much less than the number of steps in the MCMC chain, and (ii) every parameter in a multi-parameter model has a different ESS. Some parameters might have large ESS while others have small ESS. Moreover, combinations of parameters, such as a difference of two means, can have quite different ESS than the separate parameters. Therefore it is important to check the ESS of every parameter of interest, and the ESS of any interesting parameter combinations. Starting February 19, there will be a series of commentaries on the articles. I will update the blog when more information is available.